IXO replicates many other types of car, however, including road cars, endurance racers and touring cars. Again, these can be historic or modern day subjects. IXO also has a 1:43 Le Mans winners collection, and has replicated many winners of the famous race since it was first held in 1923. IXO isn’t immune to quite obscure subjects either, like Japanese police cars, or transporter cars from the Tour de France! 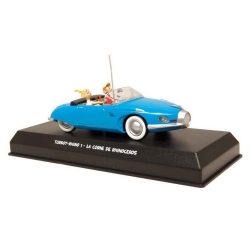 Collectible Atlas Blue Car Turbot-Rhino 1 Spirou and Fantasio 1/43. Each car is presented in a plastic case with a diorama and the history of the car.